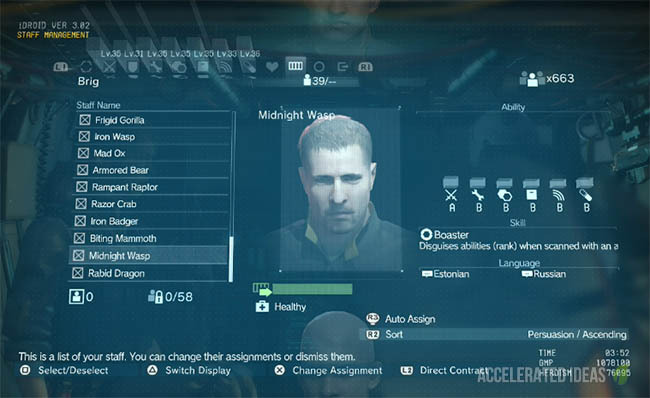 A detailed guide for MGS V Phantom Pain explaining the best starting weapon in the game - helping you quickly and efficiently surpass the early missions and reduce your retry count tremendously. This guide is intended for new players rather than pros and for those who need to get accustomed to the game. Upon starting MGS 5 you begin with a basic Assault Rifle as your primary weapon and a Stun Pistol as a secondary weapon. The assault rifle is fine as a starting weapon but I quickly lost faith in it because of its unstable nature. If you're going Rambo through a base then the assault rifle is ok for dispatching enemies in desperation but you need something more clinical to get those higher ratings. The stun pistol is the better choice if you're rehearsed in stealth tactics but it'll still take two to three shots to knock someone out entirely and you'll need to get really close to the enemy. There's also the risk that the enemy wakes up if you take too long. For beginners a lethal weapon is probably a better choice to get into the game. 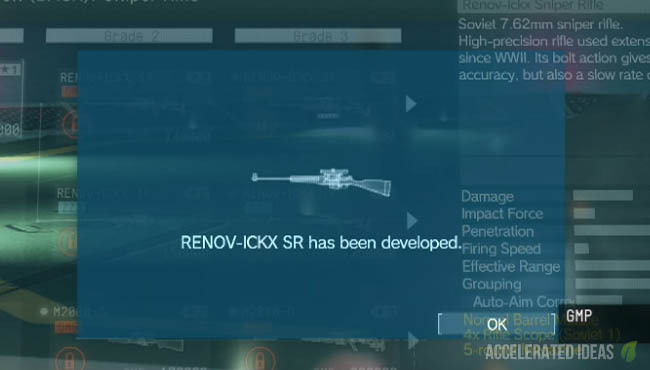 Say hello to the Renov-ICKX-SR, a basic sniper rifle that provides awesome accuracy and deadly one shot kills from afar. I love this weapon simply because it's the perfect choice for gaining a high number of headshots and helping you remain undetected. You can quite easily stay out of reach of the enemy and leisurely pick them off from long range. The only downside is the slow reload but given that it's a long range weapon, you've got plenty of time to reload and take cover between shots. Combining all of these strengths this weapon will not only increase your final score considerably but it will help you avoid multiple retries - which we all know are painful and annoying. The Renov-ICKX-SR occupies the first row of the Sniper Class of the R&D Weapons section. The Grade 1 weapon comes with 7.62 mm round, normal barrel muzzle, 4 x zoom and a 5 round mag (with about 25 in reserve). Potentially that's 25 dead enemies from the get go. 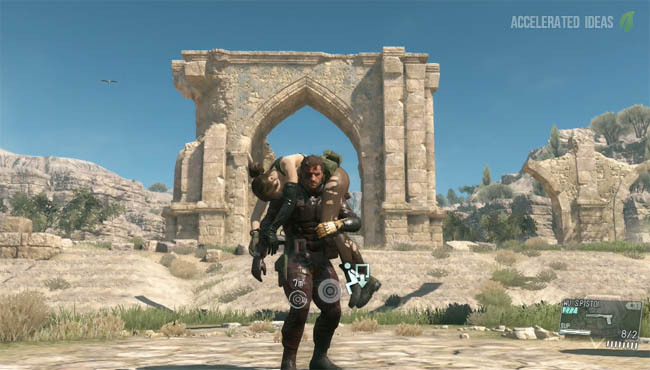 Considering that the Phantom Pain is already fairly difficult, I strongly recommend unlocking this weapon as early as possible. It only costs 40,000 GMP and requires an R&D level of at least 4. This isn't hard to achieve because money is abundantly available in the game and reaching R&D level 4 is also fairly easy so long as you Fulton enough soldiers from the first two missions. 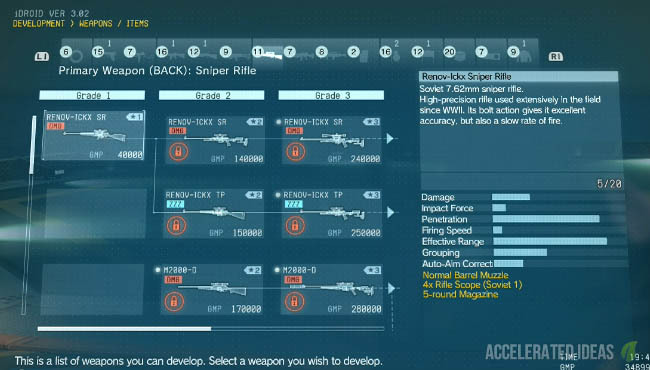 If I remember correctly I had this weapon by Mission 3. It's not going to be perfect for those who love to use stealth and takedowns but if you want to get through a particularly tough mission a little faster then the Renov-ICKX-SR is your best friend. It's only downside is that it'll blast the head off enemies, thus not giving you a chance to fulton them back to base. My advice is to Fulton high profile enemies or those that are easy to capture early in the game - then just waste everyone else in your way.